Disclaimer for First time flyers & new flyers: While this article can help you understand the world of wind tunnels a bit more, please trust and follow the instruction you receive from a trained and qualified wind tunnel instructor or coach wherever you may fly. The recent past has seen some amazing new advances in wind tunnel technology. Wind tunnels are increasing in size and speed as they are built all over the world. We see flight chambers growing both horizontally and vertically. These machines are impressive, but they come with a new set of rules. This is why it is important for manufacturers and flyers to consider the wind profile of future wind tunnels. 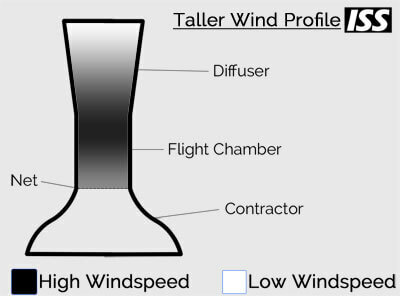 Wind Profile - A 'picture' of the wind speed in relation to the vertical space inside a wind tunnel. This picture is painted regardless of a precise set speed of a tunnel. Aspect Ratio - How the vertical speed of a wind tunnel relates to its horizontal size. This can be measured as (flight chamber width) by (wind profile) = Aspect Ratio. The contractor gradually becomes smaller until it comes to meet the flight chamber. A net or cable system separates the contractor from the flight chamber. The flight chamber is normally consistent diameter (size) throughout. Above the flight chamber is a diffuser which increases in diameter as the wind travels up through the it. Flyers are able to fly in the space above the net throughout the height of the flight chamber and diffuser. As air is pulled through the contractor the air speed increases. What is important to note is that the airspeed continues to increase as it passes through a consistently sized flight chamber. This is due to the growing boundary layer along the walls of the flight chamber. It is not until the flight chamber meets the diffuser and that diffuser begins to open, that the air begins to slow down. Generally speaking, early wall-to-wall wind tunnels featured a short flight chamber with a diffuser that opened rapidly (compared to later models). In a practical sense this created a short wind profile because the air within the flight chamber didn't have much time to accelerate, and diffused quite quickly as it passed the flight chamber. Better construction technology has enabled tunnels to feature taller flight chambers and less aggressive diffusers. As these flight chambers grow in height the true characteristics of the increasing wind speed throughout the fight chamber are now able to be experienced by the flyers. 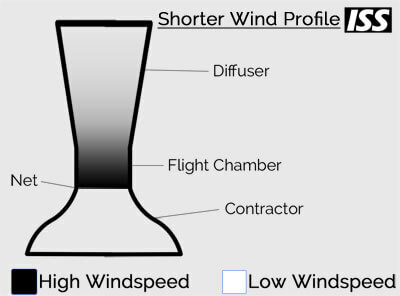 As the flight chamber grows in height and the diffuser opens less aggressively, the wind profile grows taller. Wind profiles can range from a very short profile - to a profile so tall that the speed becomes mixed. An ever increasing wind speed high up in the flight chamber leaves the area lowest in the flight chamber feeling 'soft' because the wind speed is in fact slower than above. It is important also to consider how tunnel instruction, spotting, coaching and flying is influenced by these changes. Relative to the height of a person standing on the net, the flyable space above (and out of that person's control) increases with a taller wind profile. The aspect ratio can have a big role in how a tunnel is flown. Vertical level changes can become increasingly large and fast in tall wind profiles. This can create opportunities for flyers to pass vertically much faster if their levels radically change. This can also naturally cause flyers who hold still to want to naturally do so in a much higher position. Generally speaking, wind profiles are becoming taller. Tunnels often set out to claim that top spot as the tallest, biggest, and fastest. The 'old' set of rules that applied to shorter wind profiles need to be adjusted. Flyers can fly higher, and fall faster. This is something that everyone who flies or works in a wind tunnel should take into account. An unexpected wind profile can take hold of out of control situations. Fast vertical accelerations (up and down) will occur. The reason for writing this article is so that everyone involved with the wind tunnel industry can think about these new variables, plan for them, adjust their practices, and maintain the safe environment that wind tunnels provide. Know your wind tunnel's wind profile. Give the information about your tunnel's wind profile to the flyers, coaches, and instructors that should know about it. Keep these things in mind as you fly, coach and instruct. Spreading knowledge, researching and discussing this important topic will help keep flyers safe in any wind tunnel environment. For more advanced wind tunnel topics, please see our technical information section.